 Chevoo, EVOO-marinated cubes of goat cheese in five flavors (photo courtesy Chevoo). Ready-to-eat Egg Bites from Les Trois Petites Cochons (photo courtesy 3Pigs.com). 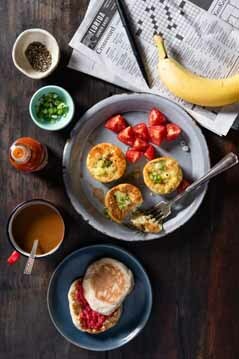 You can garnish Egg Bites any way you like, or enjoy them plain (photo courtesy 3Pigs.com). Two of Upton’s Naturals’ four Thai-inspired pastas (photo courtesy Live Kindly). This week’s picks can be served to guests or relished on one’s own. Chevoo is a new, high-end marinated goat cheese treat from northern California. Cubes of goat cheese are marinated in infused extra virgin olive oil: an “ultra-gourmet life hack for busy epicureans” says the brand, and we agree. The flavor combinations are irresistable, and there’s a bonus: After you’ve consumed the cheese, use the delicious EVOO for salads, as a bread dipper, a pasta dressing or a finishing oil. As a tidbit straight from the jar. As Bloody Mary or Martini garnish on a cocktail pick. As a gourmet garnish for just about anything. The company recommends adding to burgers, pasta, pizza, grilled vegetables. Each substantial rectangle of cheese can be sliced in half or thirds, or crumbled to make one jar go further. We like giving two or three jars to fellow foodies when we’re invited to visit. 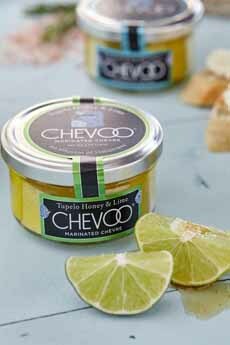 DISCOVER MORE AT CHEVOO.COM, which includes a store locator on the home page. 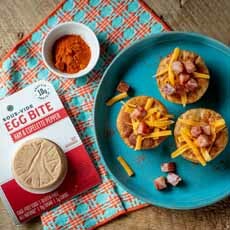 Les Trois Petits Cochons, long revered for its pates and charcuterie, has launched a new line of products: Sous-Vide Egg Bites (photos #2 and #3). The sous-vide (soo-veed) method of cooking, which has become more prominent in the U.S. over the past 10 years, allows not just for foolproof cooking with no pots to scrub, but yields a tender texture and refined flavor elements. The 2.5-ounce Bites, made with cage-free eggs are sold individually, ready to heat and eat (or, eat them chilled or at at room temperature). Each Bite has 10g protein, 1g total carbs, 0 sugar. Atop a mesclun salad as a first course (with a Dijon or honey-Dijon vinaigrette), or a more substantial luncheon salad. As “Bites Benedict,” on a toasted English muffin with bacon or ham. No hollandaise sauce is necessary, but if you want a sauce, consider cheddar cheese sauce, or the same recipe with gruyère. In a quick egg sandwich. Upton’s Naturals focuses on meat alternatives made with real, recognizable ingredients. Their latest line of Meal Kits is our favorite: pasta-based mains with Thai-inspired flavors. Massaman Curry: While not a pasta, you can serve this curry on top of pasta or rice. A Thai staple, it’s made with potatoes, carrots, green beans, purple rice and ground peanuts. Pad See Ew: This classic Thai dish is made with rice noodles, carrots, Chinese kale, and tofu topped with sesame seeds. Thai Curry Noodle:Upton’s take on the traditional Thai recipe Kaho Soi, this noodle dish is made with curry, seitan, winged beans and crunchy fried onions. Thai Spaghetti: Green curry and tomato basil sauce make this a Thai riff on Italian pasta. The products are not dehydrated, and are packaged in a retort pouch to maintain freshness (photo #4). 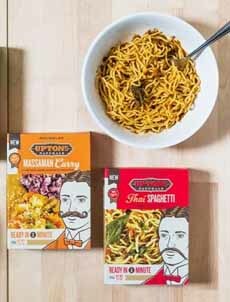 Upton’s Naturals’ Meal Kits are available at select Whole Foods Market locations, independent stores and natural food chains across the country for an SRP of $4.99 each.